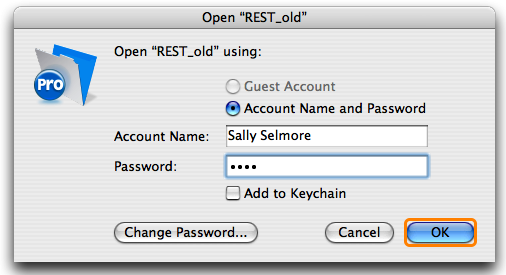 NOTE: REST Multi User 4.0 will only open in FileMaker Pro 10 or newer. 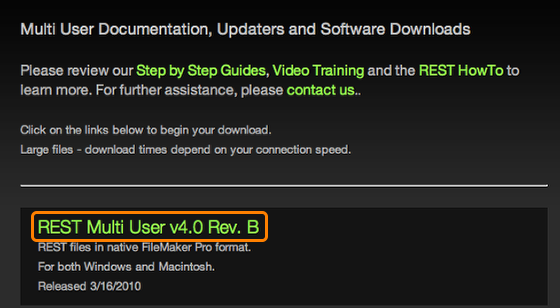 Please contact REST support if you have not obtained FileMaker Pro 10 updating information. Drag the new REST folder into your Applications folder. If you have user records that need to be deleted because the user is no longer with you, this would be a good time to make any changes, as you will be able to reassign records to a different user at the end of the update process. 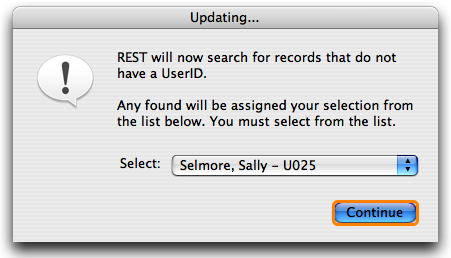 To Delete a user record, go to the Preferences area of REST and show all Users. Choose the User record you want to delete and click the Delete button (top right side of screen). This can be done in List view or Detail view. Be sure you are on the User record you want to delete! This can only be done with an Owner Level Access! a. Copy the REST.fp7 file (command-c or right-click). Example shows the RESTv37.fp7 file. Yours may be another version. b. 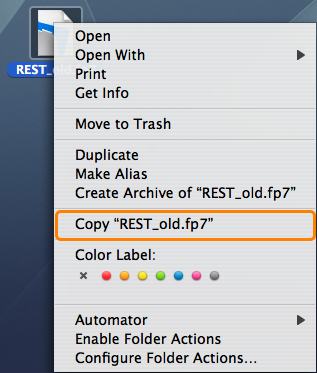 Paste the REST.fp7 file to your desktop (command-v or right-click). 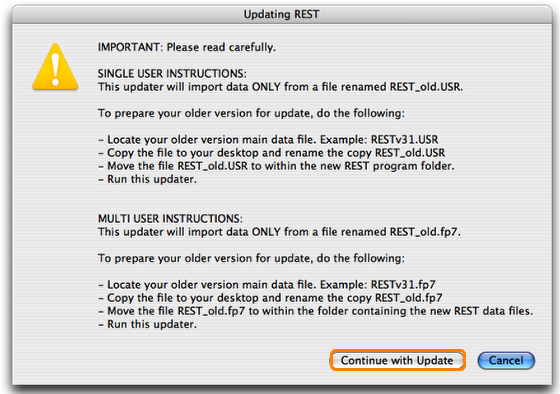 ***NOTE: Verify that you have re-named the REST file EXACTLY REST_old.fp7 or the updater will not work successfully! b. Copy (or drag) the REST_old.fp7 file. 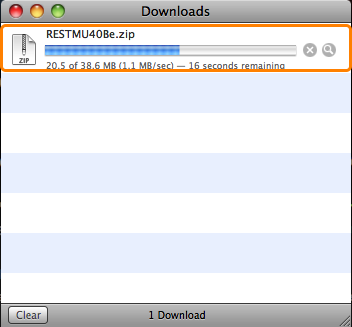 With REST_old.fp7 now located in the REST folder, you are ready to run the updater. NOTE: Before running the REST 4.0 updater user has confirmed that FileMaker Pro 10 or newer has been installed on the REST host. If you have not installed FileMaker Pro 10 do not run the updater! 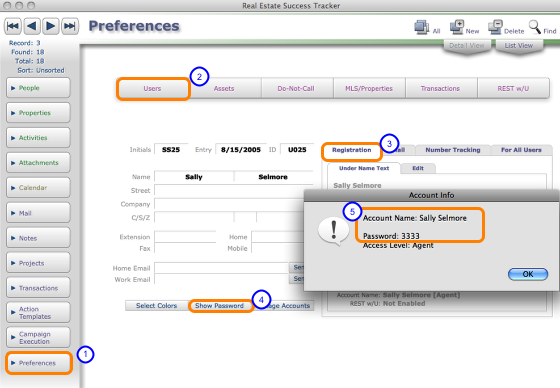 contact REST support with any questions about updating FileMaker Pro. If you have saved your REST login information to your keychain and do not remember what it is, please do the following before you proceed with the update. 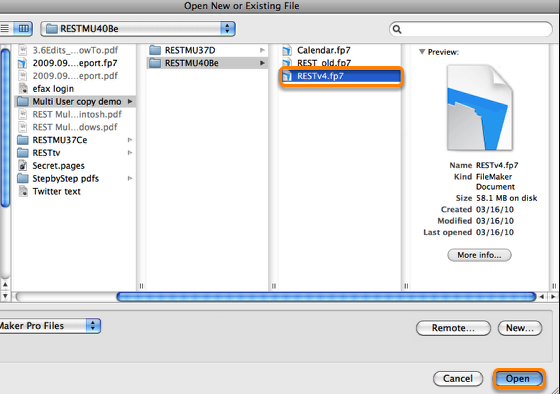 Launch FileMaker Pro to open the REST4.0 File. Click "Continue with Update" when you are ready to proceed. Click "No, do not include" if your current version of REST already has the 6 sample REST Action Templates. Click "No, do not include" if your current version of REST already has the 29 sample REST Mail Templates. Here, enter your normal Owner-level account name and password. This is where you can reassign records from a user that has been deleted from the database. All "orphan" records will go to one selected user. Read the dialog box and click "Continue". Re-Launch and begin using your New Version of REST!